It was hard to get a word out of “Silent Cal,” the president Teddy Roosevelt’s daughter once said was so sour-looking he appeared to have been weaned on a pickle. But while Coolidge was reserved in public, he apparently had plenty of fun in private. When an admirer—either a friend or an anonymous donor—sent an electric horse to the White House in 1925, Coolidge reportedly laughed so hard at the sight of William Starling, the head of the Secret Service, atop the contraption that he had to sit down. Then, he decided to try it himself—and a weird-but-true White House legend was born. Coolidge was no stranger to equines, of course. He was an outdoorsman and a horse lover. Though he fell from a horse as a child, breaking his arm, he loved horseback riding for exercise. But his increasing political duties—he was a mayor, senator, and then governor of Massachusetts before being elected as vice president and eventually becoming president in 1923—didn’t leave much leisure time. By the time he made it to the White House, Coolidge had apparently put on eight pounds. But how was an executive to exercise in the days before Shake Weights and ellipticals? Enter the electric horse. It was the brainchild of John Harvey Kellogg, the utopian doctor best known for inventing corn flakes in an attempt to cure people of their masturbation habits. Kellogg was a proponent of better living through electricity, crafting scores of inventions that promised to vibrate, shake, and shock patients back to health. He claimed that one of his apparatuses for “automatic exercise,” which he called “the riding horse,” perfectly imitated the single-foot and English trot gaits of a real horse. Coolidge apparently thought so, too. Though The New York Times mocked the device as “a hobby horse” in 1923, it cited friends who thought that the president's strength and stamina as a leader were due “in large part to the attention he has given his electric horse.” From a canter to a gallop, Coolidge rode it three times a day. The president’s personal physician told The Chicago Tribune that while “the horse is not much for looks,” it had some medical benefits. “It is great for the liver and fine for reducing flesh,” he declared. The story was apparently kept secret until Coolidge had to send for an electrician to repair his steed after it went berserk and bucked him from the saddle. 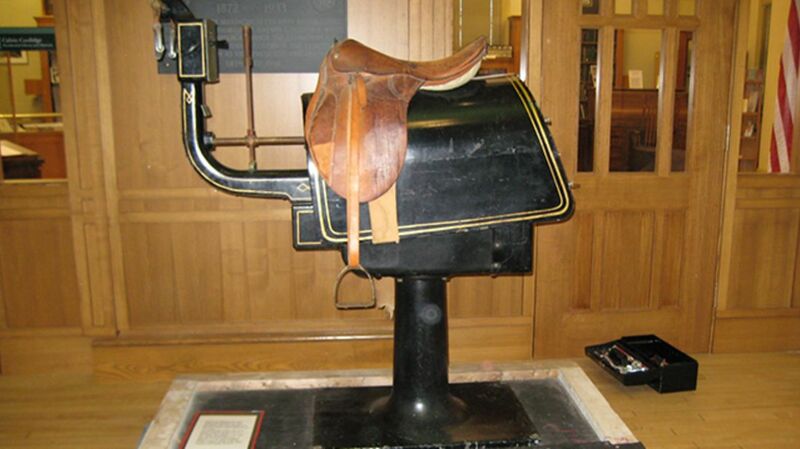 Today, the president’s trusty horse stands in the Calvin Coolidge Presidential Library and Museum in Northampton, Massachusetts, a testament to the quiet president’s thrice-daily dose of whimsy—and fitness.